For some who dream of visiting Alaska, the mountains, most notably Denali, are what draws them here. Even though the High One herself is fickle about appearances, guests take the chance, spending hours, days and lots of money to catch a glimpse of her summit. We who are blessed to live here often use the Alaska Range and Denali as touchpoints to set the tone of our day. “The Mountain’s out,” can be heard in office buildings, school hallways, and even car radios as the sliver of pink appears in the morning. It’s hard to have a bad day after seeing Denali. It’s even harder to imagine one could ever gaze at the world in the same way after standing close enough to feel the whispy breath Denali generates on a regular basis. Watching a mountain create its own weather is, frankly, a wonder. I wrote my first story in 2016 about Don Sheldon and his vision for the nunatak he purchased after flying around Denali with Mr. Washburn more than 70 years ago. 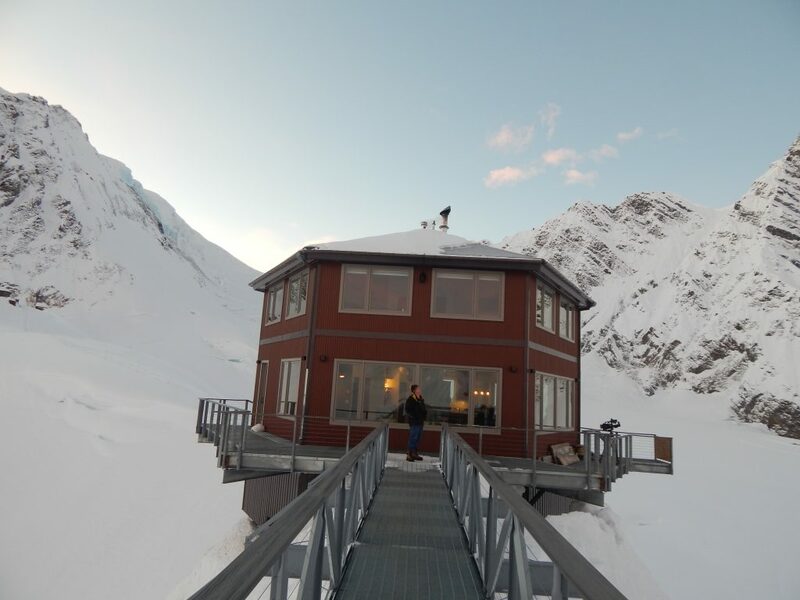 The Sheldon Mountain House was and still is a marvel – sitting at nearly 6,000 feet in elevation, it became the 200 square-foot hexagonal hub for mountaineers and the Sheldons, Don and his wife Roberta, to entertain friends and envelop themselves and their guests in magical experiences that can only be found upon Denali. Don and Roberta were visionaries, not for themselves, but for Alaska. In one of many conversations I’ve had with son Robert and daughter Kate, time and time again the concept of “vision” came up. What if, Don and Roberta wondered, other people – the readers, watchers, wanderers, and explorers who loved Alaska but never, ever thought for a second could reach this place – were able to visit? Don knew the nunatak was an anchor for a larger project, one he sadly would never complete himself. Don Sheldon died in 1974, when Robert was four and Kate, six (older sister Holly was eight). Roberta managed on her own, raising three kids and manage the Mountain House and an air service. Taking on a new project upon North America’s highest peak had to take a back seat in favor of supporting her family. Robert and Kate always knew there was more in mind for the nunatak – their mother had talked about it. The two siblings created a plan for adding a second building, twisting and turning concepts around in their heads whenever they got together, and eventually decisions made it on paper. Roberta passed away in 2014, and as the family sifted through a lifetime of her many writings (Roberta was also a committed author and community activist), Robert’s wife Marne discovered something interesting. Robert and Kate inspected the document, and their own drawings, and the two matched in near-synchronicity. 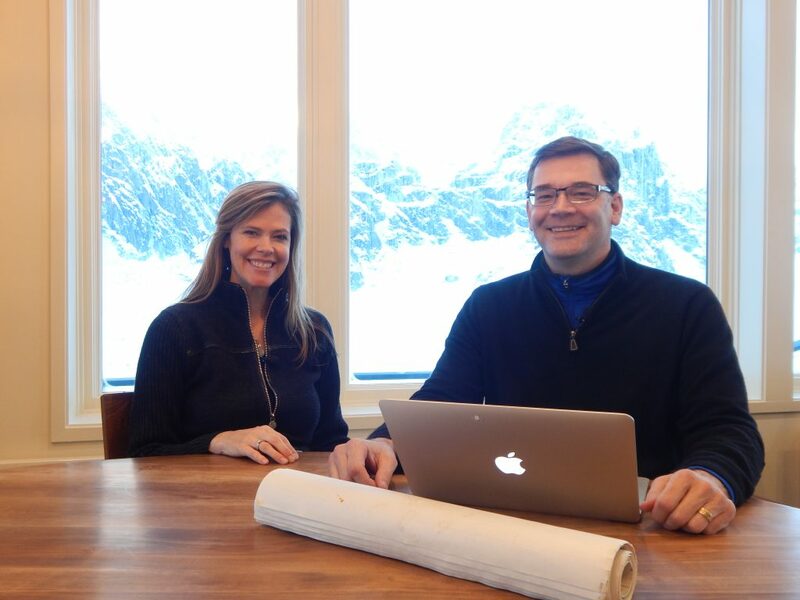 In 2015 a formative plan was launched in earnest, and by summer of 2016, I was standing on a snowy patch of rock near the Mountain House staring at a spider web of metal that, Robert told me, was going to be the Sheldon Chalet. I have been privileged to follow the project ever since; from its initial K’Nex-like construction in a old work yard in South Anchorage to the flying up of the parts and pieces to the thousands and thousands of hours of work done by gifted craftsmen and the Sheldon family themselves. And finally, finally, I met Robert at the Talkeetna airport last week and flew up as a guest to the only place in the world where history meets family meets mountain. At around 2,000 square feet in size, the Sheldon Chalet was an expansive (and expensive) project indeed, considering the location, materials, and commitment of the family to be as low-impact, high-eco-friendly as possible. 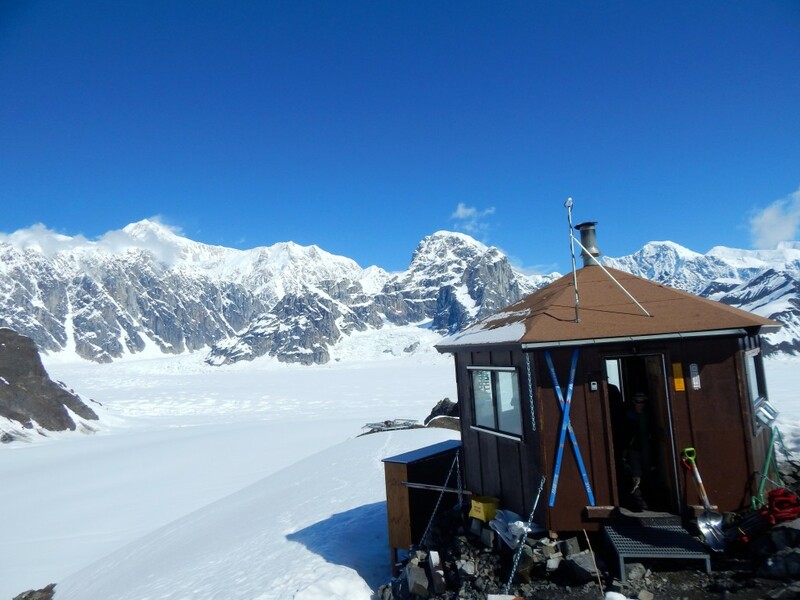 Robert intimated several times his desire to “be good neighbors” to the national park upon which the nunatak and buildings sit, and it is evident in everything from solar panels to eco-sensitive toilet systems. With two levels and room for 10 overnight guests, it’s roomier and more luxurious than the sparse but equally-charming Mountain House, and there’s a reason for that. Guests at the Mountain House are there for adventure, activity, and, in some cases, ultimate solitude with no frills but solid comfort nonetheless. 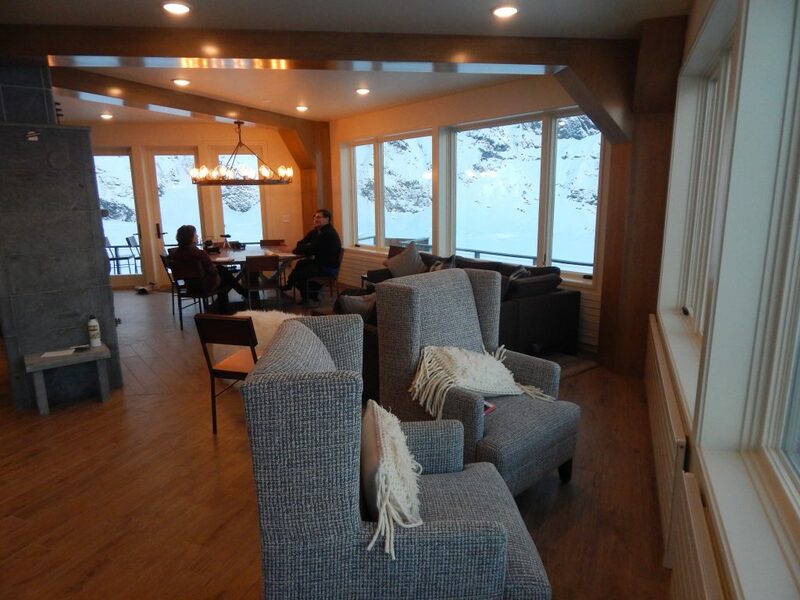 The Chalet, by contrast, was specifically designed to accommodate the luxury adventure traveler; that is, people who want to see high places but also want the fancies to which they are accustomed. Or, perhaps, special occasion, once-in-a-lifetime travelers wish to go all out to mark their only trip to a place few people are able to spend time. Whatever the reason, if it’s the Chalet they seek, it’s the Chalet they shall have. Banks of windows provide open expanses of mountains, glaciers, clouds, aurora – everything a high-altitude traveler would expect. 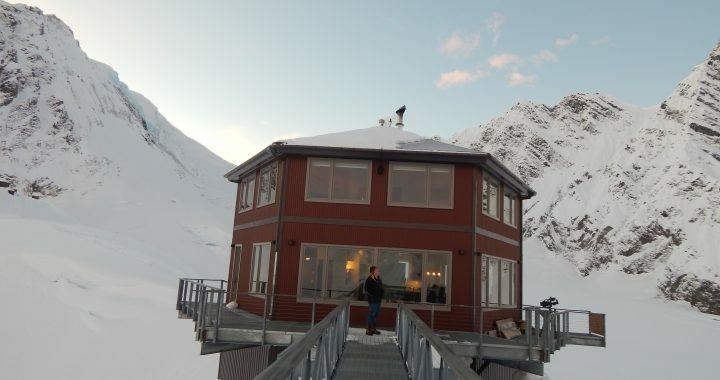 Cocktails and gourmet meals with as many locally-sourced ingredients as possible (a further commitment of the Sheldon family to Alaska industry). Fine wine. Feather beds. It was, yes, sublime for someone whose typical mountain cabin experience involves a Therm-A-Rest and 0F-rated sleeping bag. Guests who pay the $2,300 per person/3-day, all-inclusive stay are treated to a flightseeing adventure on both the arrival and departure trips from Talkeetna or Anchorage (for an additional cost). If visitors are adept at skiing or mountaineering they can grab a guide and take a trip to one of the hidden ridges or landscapes scoped out by a guide service (details are still in negotiation so I will not mention the name). At night, a bonfire out on the helicopter pad makes aurora and star-gazing a perfect activity to end the day. 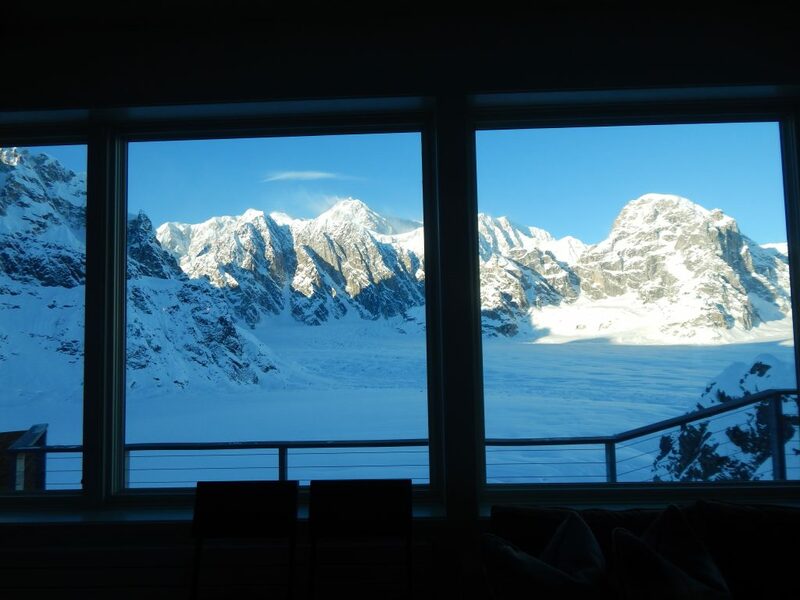 Lest you think, however, that the Sheldon family is seeking only to profit mightily from this new form of luxury adventure travel, it is important to note that Robert Sheldon wants to create an entire “ecosystem” of opportunities with the Chalet and Mountain House. He’s already working with educational outlets, non-profit businesses, and other organizations to create value-added experiences for research and opportunity to groups that might not otherwise have access. The Sheldon Mountain House will be offering day trip picnics at a mid-point price range as a vehicle to introduce people to the place, and the people who began this journey. “It is what my mom and dad wanted,” Kate Sheldon told me as we sat in big chairs overlooking the amphitheater named for her father. I do, however, remain conflicted about which place feels better to me. Before I flew out on Wednesday afternoon, I took a hike up to the Mountain House. The air was fresh with no sound but boots upon the snow and my heartbeat in my ears. As I approached the little cabin that started it all, the summit of Denali was reflected in the windows. I wound my way past a woodshed and bumped open the door, where a little stove burned cheerily and the auora of more than a half-century of adventurers greeted me with maps, old coffee cups, and a journal of past visitors. Sitting on the plastic cushions that serve as both bench and sleeping area for visitors, I sipped a Denali Brewing Company Mother Ale and contemplated this place in contrast to its newer sibling visible from my perch. Luxury, I finally decided, is a state of mind. And I had found mine. The Sheldon Mountain House and Chalet website is just about ready for visitors, so soon you can go HERE and find out everything you need for a day or overnight visit. 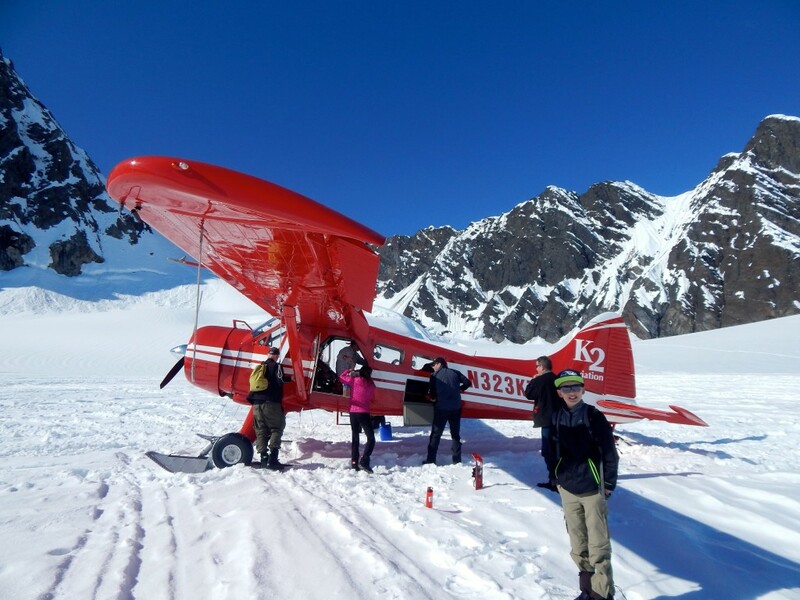 K2 Aviation is the company of choice for flightseeing trips to and from Don Sheldon Amphitheater/Ruth Glacier, where the nunatak is located and where thousands of people arrive for a 20-minute stop to say they landed on a centuries-old plank of ice. Alpha Aviation provides helicopter transport for those who would prefer a different mode of travel to and from the nunatak. They also offer amazing heli-skiing and hiking adventures as an add-on to the trip. Amazing – as in – OH MY GOSH moments. Take a look at our pilot, Chad, taking us through a slot in the back of Moose’s Tooth! If you desire to take kids, be forewarned that the Sheldon family will vet your abilities and desires before they take your money. 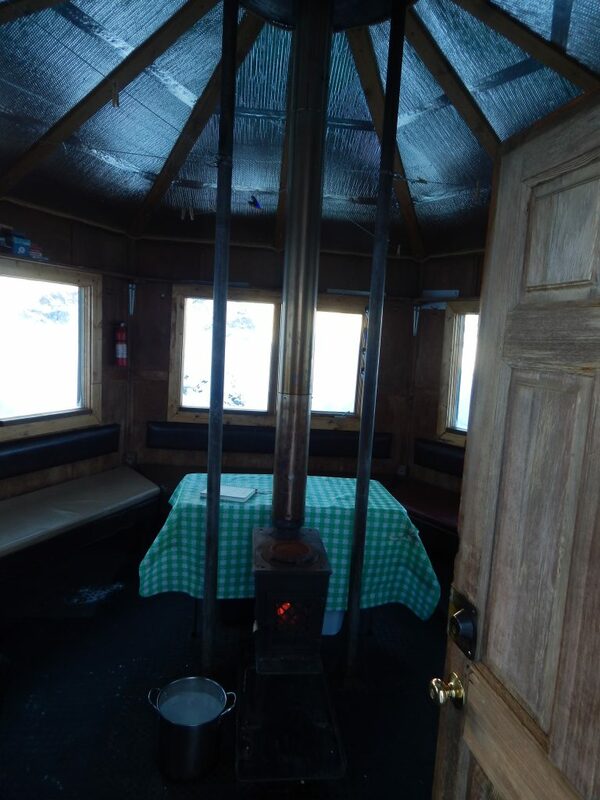 Anyone who visits either the Chalet or Mountain House must know that the nunatak is narrow, high, and not suited for kids under 12, or any kid who doesn’t possess at least a rudimentary background in mountaineering, backcountry skiing, crevasses, and following directions. 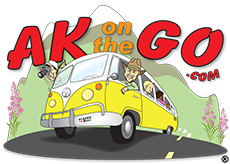 Posted in Big Adventures, Denali National Park and tagged adventure travel, Alaska, Denali, Denali National Park, Don Sheldon, Flightseeing, heliskiing, mountaineering, Sheldon Chalet, Sheldon Mountain House, teen travel.